In such words Canadian Prime Minister Pierre Trudeau’s foreign policy advisor, Ivan Head, addressed to the Soviet Ambassador in Canada at that time Alexander Yakovlev. Ivan Head wrote an article “The Foreign Policy of the New Canada” in 1973. 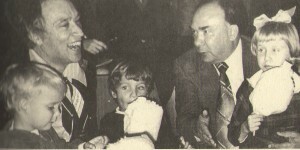 At the beginning of a posting, Yakovlev met head and later with the brilliant Canadian Prime Minister Pierre Trudeau and became good friends with them. To the left one can see a picture of the two great people, Yakovlev and Trudeau enjoying their time with kids. 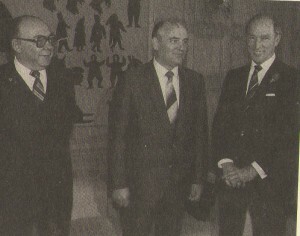 To the right: a photo of trio: Trudeau, Yakovlev, Gorbachev at the dawn of perestroika years. Our today’s guest is Mr. James Holly whom I am interviewing. 1.How old were you at Trudeau’s time? 1.What was the political, economical and social life then in Canada? 2.Economically it was not bad but politically the separatists in Quebec were creating political turmoil. Social programs were accessible to everyone and worked well. 1. Have you ever heard about Yakovlev in Canada? 2.Yes, but never followed very closely. 1. Were you personally interested in info about the Soviet Union in regards to your father’s Slovak origin? 2.Sure. When I was at my Senior High School years I wrote a term paper on Soviet Life, and it was my Dad, Viktor Holly who immigrated to Canada in 1927, helped me with the request-letter to the Soviet Embassy in Ottawa about the Soviet life. They sent us a big volume of papers and I prepared a good school work. My teachers nevertheless did not look at this too favorably because of Cold War Iron Curtain. 1.Oh, well. What do you think about the new Canada at that time? What was actually new? 2. A lot. Trudeau was a person who was not afraid to shake up the established order of the day and reshape the social and political landscape of Canada. For, instance, he decriminalized the gay life style. He used to say:”The Government has no place in the bedrooms of the nation.” I remember that as if it was yesterday. He established the concept of multiculturalism in Canada as different from the American concept of “melting pot” which means so little in modern America. He brought in “The Charter of Rights and Freedoms of Canadian Citizens”. 1.How do you consider, Mr. Holly, Gorbachev’s visit to Canada back in 1983? 2. Michael Gorbachev with the help of Yakovlev opened the door of the Western World to Russia. The Iron Curtain started to crumble. The people of the Eastern Block like Slovakia< Poland etc. started to have a taste of real freedom. 1.How did it touch your father? Did he dream about such changes in political climate between European and North American countries? 2. He never did. His only interests were of his family there. He died on December 6, 1975 just before those changes started. 1.Pity. But because of free thinking development, and people’s experiences like Trudeau, Yakovlev, Gorbachev in different models of social structures and tolerance to their diversity the world is becoming better.